The shadow fluttered, always hovering just inside Kelli's sight. It started as a smudge in the corner of her eye, growing bolder until she turned her head for a better look and then it would disappear. It always eluded her efforts to catch a glimpse. Her mom called them shadow men. She had noticed them since she was five years old and the first time it startled her so much she ran to her room and hid underneath the bed. Eventually she told her mother about the shadows, quick as lightning and impossible to catch. Kelli was six then. Her mother had smiled and told her a story of the shadow men. They were harmless, tricksters really. If Kelli didn't want to imagine, her mom would take her to the doctor and he would tell her they were just dust particles floating in her eye, causing the illusion of movement. Her mother had her press her hands tight against her eyes, showing her another trick the eyes could play. Kaleidoscopes of color burst behind her lids and she laughed. No, the darting black smudges had never scared her. They were gone so quickly it was hard to say how she felt about them. They awakened her curiosity and she promised that next time she saw one she would follow. She might get lucky and be able to follow a shadow to where they lived. Deep down she knew there was a logical explanation. Her mom had told her so. It was just fun to imagine. Here was one now, fading quickly in the corner of her eye so she started the game, giggling with delight. Chasing shadows would be fun and she would only be gone a few minutes. Shadows had better things to do than playing with her all day and they were cooperating, appearing every few seconds so she could keep up. She was so intent on following it she had wandered into the woods behind her house. They were off limits unless her mom was with her but Kelli didn't pause. She ignored the thorns that bit into her legs, there was time for soap and bandages later, and she'd be back before her mom even knew she was gone. She wanted to catch the shadow man. The shadow darted and she followed deeper into the forest. Her excitement disappeared when she realized the shadow had slipped inside a hollow tree. A few dry leaves clung to the branches and it was losing the battle to stay upright. Her eyes grew big as she glanced up, noticing the forest had swallowed her and she hadn't even known. The smell of freshly fallen leaves turned dank in this place, assaulting her nose before settling into the pit of her stomach. A tickling panic set in and she silenced her scared sobs and stumbled, her hand rasping against the rough bark. She started whispering to herself, that she wasn't lost. She would just gather herself together and find her way home. The shadow was gone now, the game was over and maybe shadow men weren't fun after all. She wiped her face, dirt streaked her cheeks and it grew darker. Kelli heard strange voices whispering her name. They floated on the wind and the branches clacked like dry bones. Her head whipped in a frenzy, her ears trying to pinpoint the sound until her curls tangled in a low branch. She wrenched free, the panic now bottomless, and she shook uncontrollably. The voices were coming from inside the tree. The shadow man had gone inside but he still wanted to play. Kelli tried to get her feet to take her home but her fear kept her frozen and she turned towards the tree. She leaned closer, drawn by her fear to confront the voices swirling within the hypnotic darkness. The wind began to roar and the tree shook, the shadow man shot out to blanket the small girl. 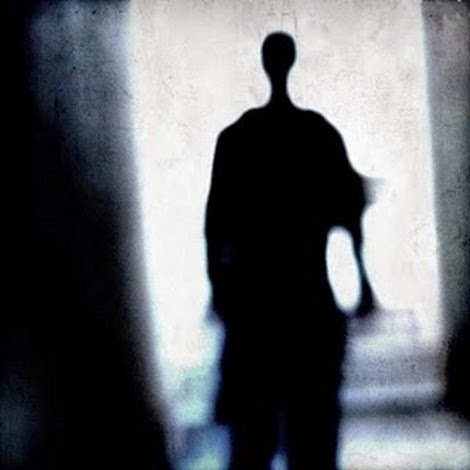 A malevolent moan rumbled through the air and Kelli's shrill scream of terror burst and faded as she and the shadow man dissipated into thin air. Everything settled back into silence. A year had passed since Susan's daughter had vanished. The woman was sitting at the kitchen table, listless and limp, staring at a postcard that had come in the mail. The headline read "HAVE YOU SEEN ME" and underneath was a picture of Kelli. Mesmerized by her daughter's eyes, she begged forgiveness from the postcard. A knock at the door startled her out of her anguish, guilt made her clutch the paper to her chest and she wiped away her tears. Grief made her old before her time, and with the shuffle of an ancient woman she plodded to the door to open it. A rotten odor she hadn't noticed before hung heavy, unpleasant enough to make her cringe. The door swung open. She stepped back in horror. It was Kelli. Susan reached for her lost daughter before she noticed the grayness of the girl's skin. Her baby's eyes that were once a bright blue were now black. The child's head hung to the side and Susan stumbled back, realizing that hideous smell of decay was coming from Kelli. Her jaw dropped open, impossibly wide, her body jerking. Her voice hissed, dripping with accusation. "You were wrong about the shadow men, Momma. They're not nice at all." Black erupted from the girl's mouth and eyes, tendrils of shadow darted and clung to Susan, enveloping her completely before she could manage a scream. Susan struggled even as her shadow-wrapped body evaporated like sun-drenched fog. An eerie moan played along for a few moments before fading, leaving only the ticking of the clock on the wall to echo in the empty house. The postcard of Kelli fluttered to the floor, and after awhile there was only the sun casting shadows on the wall. Gave me a picture in my mind. Really intense. Loved it. Great work.